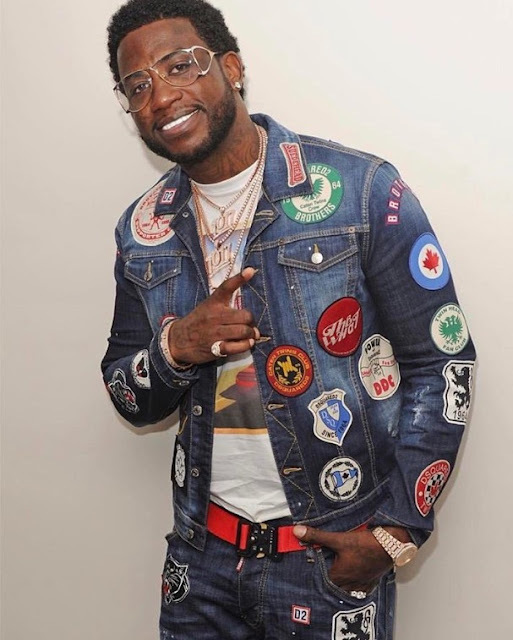 I want to preface this post by saying I'm not a connoisseur of Gucci Mane, but over the past year I have developed an appreciation for him as an artist and for being the ultimate comeback kid. I don't discuss artists that often as its not really my lane, but I've felt compelled to right this piece for quite sometime. 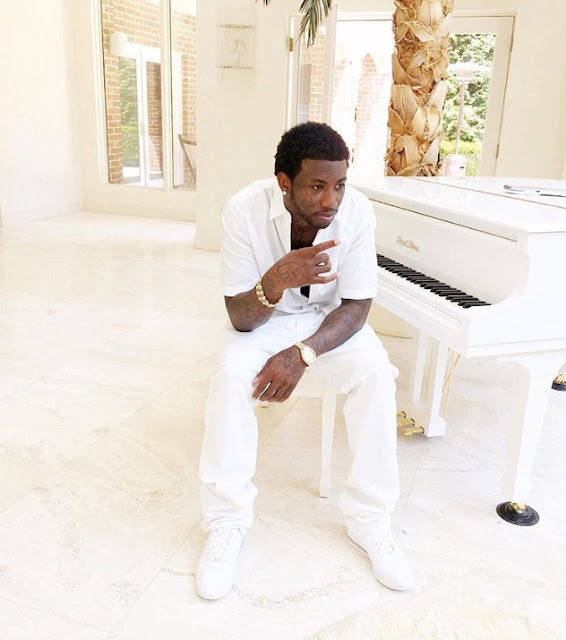 Many of you know Radric Davis, aka Gucci Mane, for being a pioneer of trap music. You don't have to be an Atlantan to understand his contribution to the industry and appreciate his rap style. For the better part of a decade he has dominated the charts with hits like Wasted & I Think I love Her and rose to international acclaim. Now, it's no secret that in the music industry, drugs, alcohol and excess trap many artists. Gucci Mane was not immune. Over the years he was involved in many run-ins with the law and ultimately went to federal prison for over 2 years on a gun charge. I'm not going to even attempt to scratch the surface of that as there are far too many details that aren't pertinent to this particular story. Prior to going away, he had amassed such and impressive catalogue of music that he remained relevant by continuously releasing new music while incarcerated. This was the beginning of the redemption. 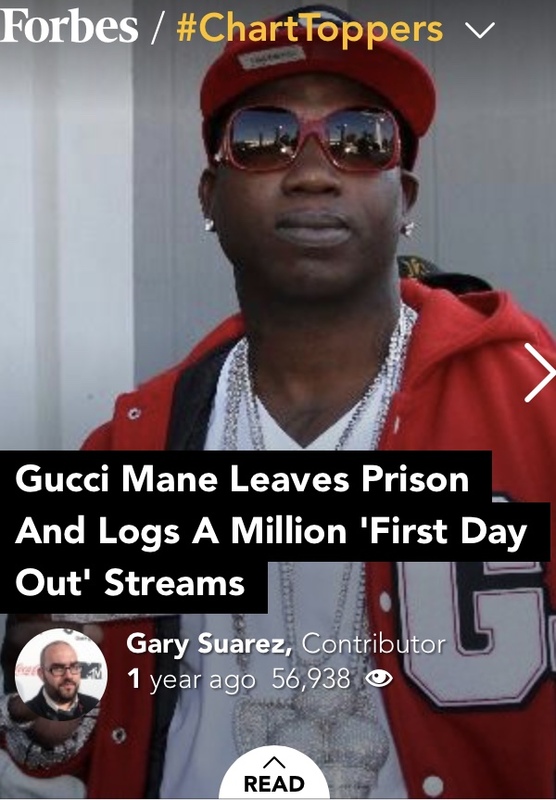 He made over a million dollars while in jail and when he was released on May 26, 2016 he recorded & released the single "First Day Out of the Feds." "In 12 hours this single had over 900,000 streams on SoundCloud and surpassed 1 million in the first 24 hours. (Gary Suarez, Forbes Contributor)" Although I was familiar with his music, this is when my true appreciation began. When this artist who had spent the better part of his career marred in controversy was gracing the pages of Forbes online, how could you not take notice? As time passed, photos emerged of a noticeably thinner Gucci whose demeanor appeared to be more calm and focused. 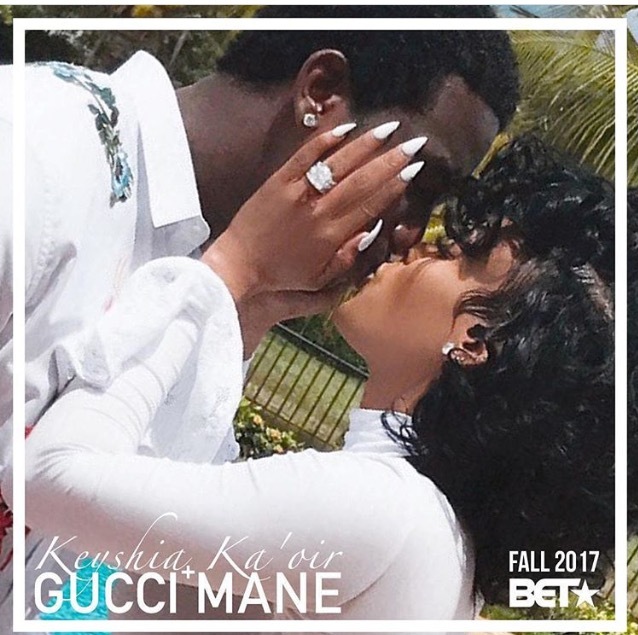 Behind every great man is a strong woman, and his longtime leading lady Keyshia Ka'oir has been by his side through it all. 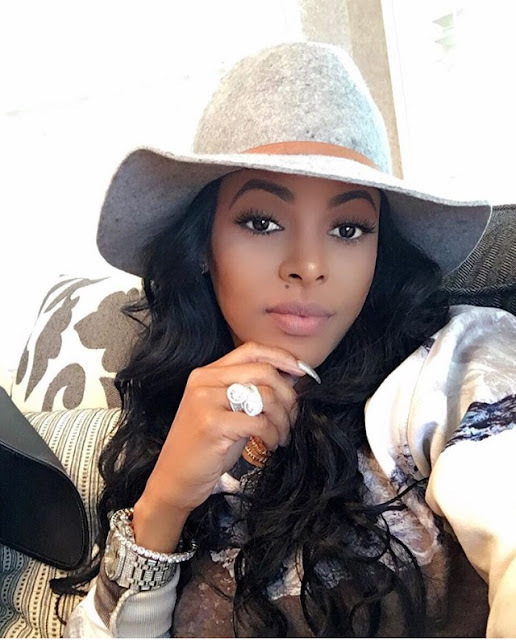 She also isn't riding the coat tails of her man, but has amassed a very lucrative fitness and beauty empire. Watching the evolution of Gucci has been inspiring to say the least. Over the past year his once prominent facial tattoos have faded away, a gold grill has been replace with rows of pearly whites, and his style is the perfect balance of designer whimsy meets street chic. It's so refreshing to see his new life play out on social media. 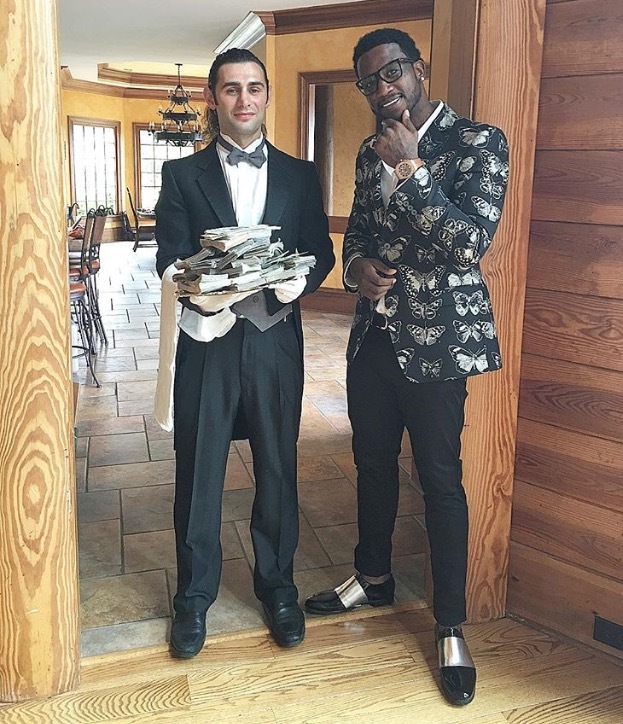 "The Wopsters" are living life on their own terms and smiling all the way to the bank. The tale of Gucci Mane is endearing. No matter what you've done or been through, you can find redemption. By focusing on your purpose and surrounding yourself with people who believe in you, anything is possible. 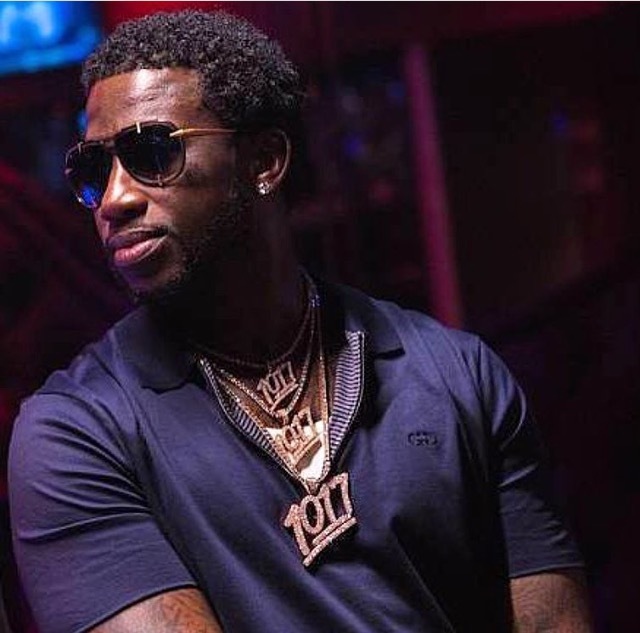 Throughout it all, Gucci has remained true to himself as an artist and is now using the pitfalls of his past as the stepping stones to his promising future. 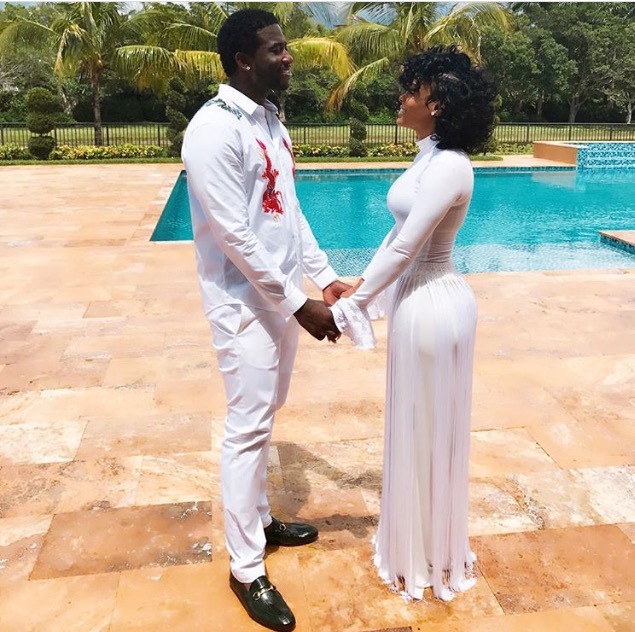 Congratulations Gucci & Keyshia! I'll definitely save the date 10/17/17 to see your wedding air on BET! Happy Saturday! If you follow me on instagram, then you may remember a beautiful black & red floral skirt I wore to SCADFash a couple of weeks ago. However, that was not my first time wearing the skirt. Of all the pieces I have commissioned my designer pal Shang Coleman to make, this one was the important. He usually is designing something for me to cover fashion week or stun on the red carpet, but this particular skirt was designed to be a tribute to a very special woman. As you're aware, I have been MIA for a while. Over the past year, my grandmother had been in declining health and family comes first. I started and stopped so many blog posts over the last year, but could never find the words to complete them. After fighting a good fight, my grandmother passed away on April 11, 2017. We were very close and losing her has been one of greatest heartbreaks of my life. She taught me so much about entertaining and style and how to be a strong woman. Even when she felt the worst, she always managed to keep her hair brushed an put on her signature red lipstick. Whenever I would visit her, I would always polish her nails, red of course, and talk about the latest fashion trends and styles. If I happened to have new clothes in the car, I would always put them on and give her an impromptu fashion show. 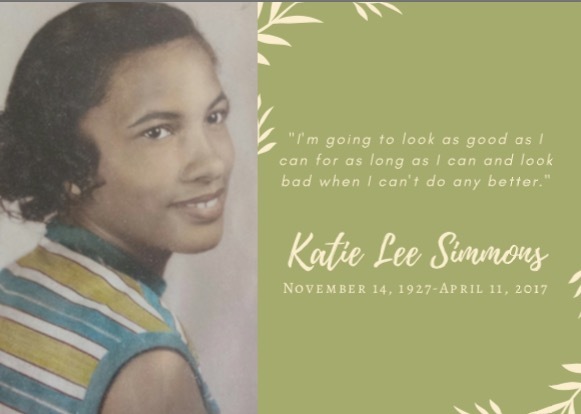 Therefore when it came time to decide what to wear to her funeral, I immediately knew I wanted to honor her and her fashionable past. I gave Shang a call and gave him some direction for the amazing piece of fabric that I found in LA last year and he created the most perfect skirt ever in 2 days. The inspiration was the retro glam, Dior Fresh Look era of the 1940s, but with a modern flare. For the funeral I paired the look with my trusty Fashion to Figure peplum, a black fascinator and red fringe sandals. The interesting thing about fashion is that it has power. The power to transform, the power to excite, but for me it has the power to heal. Wearing this skirt for my grandmother gave me a renewed since of purpose. Seeing her body deteriorate and ultimately looking at the shell that was left made me realize that I have a lot more living to do. I have many more lives to impact with my gift. She showed me that life really is what you make it and that you have a choice everyday to live it or waste it. I didn't realize how much time I had been wasting until her time here ended. In death, she taught me the true meaning of life and for that I will am forever grateful. Even though it's hard for me not to be able to call her or go and polish her nails, in her words, "I'm going to look as good as I can for as long as I can and look bad when I can't do any better." I love you Katie Lee Parker Simmons, and thank you for everything. Happy June! How has everyone been doing? I know it's been a while, but I'll catch you up on what my whereabouts a little later in an attempt to keep this post lighthearted. With summer being just around the corner, I thought I would kick off the month with you guys talking about the fabulous new swimwear collection from Fashion To Figure. The collection launched last month and it is 1000% fabulous! The day the collection hit the store, I was there to give them a try. Of course I had already level 5 stalked the collection online and had determined these were the pieces I had to have. After playing dress up for a bit, I decided on the Santa Maria Floral Bikini top with the black bikini bottom. I also purchased the Santa Cruz Halter top with a coral bikini bottom. Both of the suits were perfect for my Dominican Republic trip, and boy did they make a splash (no pun intended). On a side note, the beach was absolutely beautiful and right on time. I really needed to time to decompress and process some major life events. Like I said, I'll share those things with you in due time. Back to suits... Obviously, I have very large breasts and the suits offered lots of support without feeling too constricting. I felt like the girls stayed in place nicely and the briefs fit true to size. They didn't feel to tight or cut into my skin. If you're looking for some great swimwear that won't break the bank, I definitely recommend checking out the new FTF Swim Collection. They have already added a few new pieces and of course they are already on the way to my house, lol! Happy Shopping! Editors Note: This post was written on Sunday, January 15, 2017 in the sanctuary of New Birth Missionary Baptist Church. Today I mourn the death of a man that meant the world to me. Although our interactions were not plentiful, the times we did have together were always meaningful. Though the latter part of his legacy was marred by controversy, none of it negated all of the good he did. Bishop Eddie Long was a larger than life man with an even greater heart and spirit. The first day I stepped into New Birth, I knew I was home. After several encounters with The Bishop, there was no doubt in my mind that he was a man truly after God's own heart. The spiritual covering that he brought into my life was always inspiring. Not a single time that I stepped into NBMBC, did I not receive a word that spoke to my heart and state of being. I was reflecting with a friend this past week, that being received by Bishop Eddie Long on the day I joined NBMBC was one of the top 3 spiritual moments I have ever experienced in my entire life. The care that he took when he greeted me and the kindness that radiated from his smile is something that I will always carry with me. So, as I sit here, on the day you departed in the place where it all began, staring at an empty podium that I will never again see you behind, I am receiving this word directly from you. With every death there comes a "New Birth"... a new spirit, a new body, a restoration of "life" and a chance to truly be free. For those who are left behind it's a second chance, a time to hit the reset button and another opportunity to get it right. We get a chance to not reflect on what we have lost, but what we have gained. We get another day to embrace our purpose, and another chance to walk in our destiny. With that comes the realization that although the cycle of life feels like a desolate road at times, it is really the pathway to a higher level of consciousness unsurpassed by reason. It's a chance to leave our impression on the world so that when our time here is done, the cycle of a “new birth” will be continued in those that loved us. God Bless You Bishop Eddie Long and thank you for your contribution to the world! Hey Babes! How's it been going? If you have been following me on Instagram, you already know I have been all over the place. 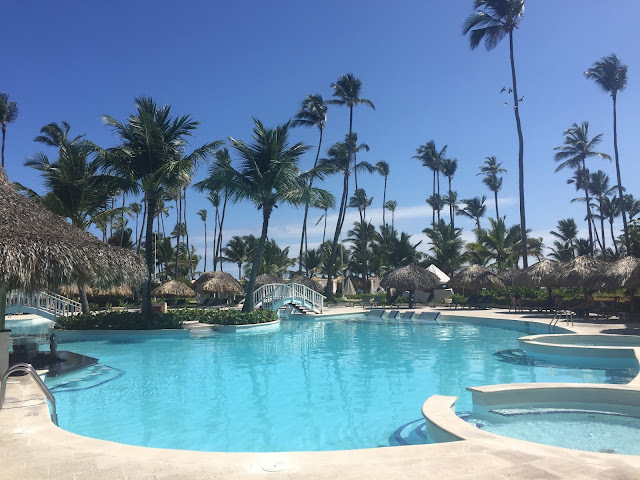 From Puerto Rico, to NYC to the Dominican Republic and back! I have had a blast and will definitely catch you up with my adventures, but I have also had some amazing opportunities along the way. One opportunity is exciting and always fun. I have been invited back to Henri Bendel Lenox Square to host another sip & shop!!!! This is my 3rd year and I couldn't be more pleased. This year's event will be really fun as I am hosting a Saturday Brunch at Bendel!! Join me for Mimosas, sweets and the latest and greatest from Henri Bendel! All of the deets are below and I can't wait to see you there! Grab you tickets here. Happy Monday! How was your weekend? While perusing my emails on Saturday, I came across one from Just Fab. This is nothing new for me because they always send me deets on the latest in shoes, accessories and clothes that are too small for me. Much to my surprise, this email showcased a curvy model and the announcement of Just Fab Plus!!! Needless to say, I totally swooned and immediately logged into the site to check things out. For an intro collection, the pieces aren't too bad. The collection encompasses a series of fashionable basics that can be incorporated w/ your current wardrobe. The pieces range from 16w to 24w and none of the pieces are over $50 dollars. If you're a VIP member, most of the pieces are around $39.95. What do you think? 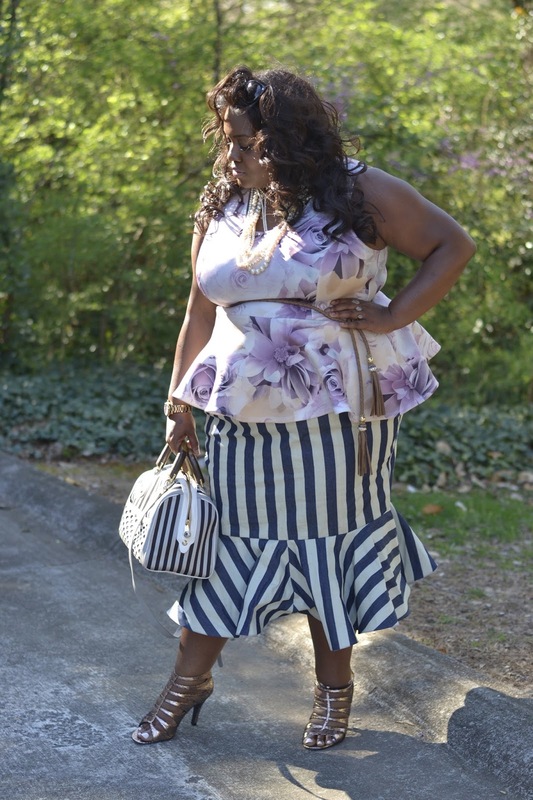 If you aren't a member of Just Fab yet, click HERE to shop these fun pieces and become a VIP. I've already got a few pieces on the way and will do a fun #OOTD post as soon as they arrive! Happy Shopping! See you on the front row! It's Friday and the official finale of my first ever Something Old, Something New Challenge. 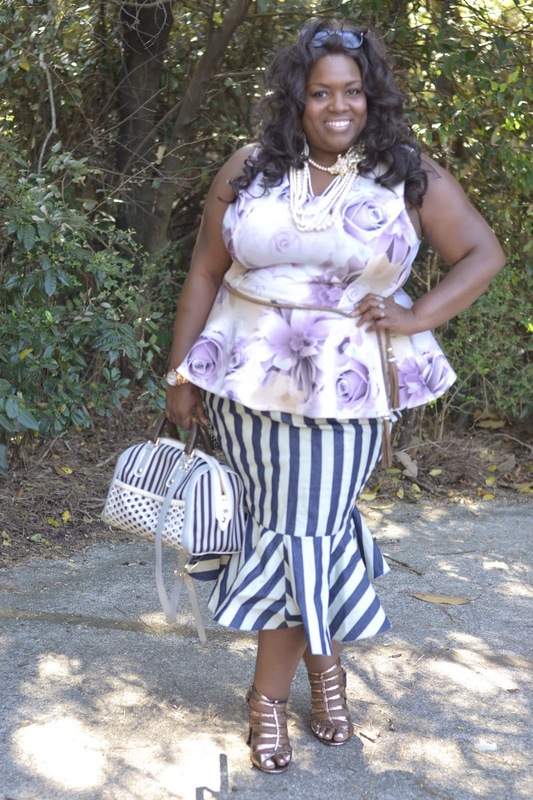 If this is your first time visiting, I challenged myself to create 5 days of outfits w/ old things from my closet and my new Fashion to Figure Secret Gardens Peplum. Today's ensemble is hands down my favorite look of the week. Although it's a little dressy, I could imagine wearing this to a wedding, on date night or even to a fabulous brunch. For this finale look, I paired my FTF Peplum w/ another amazing Shang Coleman Original striped, custom mermaid skirt. Even though the skirt is striped, it's DENIM! Denim, to me, is automatically a neutral, no matter the shade. I think it's the perfect, interesting pop that doesn't take away from the top. To round out the look, I chose some to my favorite accessories. Normally I wouldn't wear a longer statement necklace and a belt, but in this case wanted to create more definition at the waist. 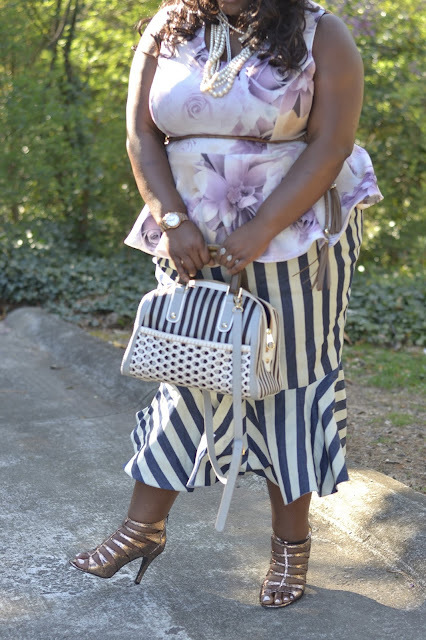 To add another layer of fun, I paired the look w/ my FAVORITE Henri Bendel bag form last summer and strappy, Lane Bryant sandals. What do you think? Thank you so much for those of you who have supported me on social media this week w/ your positive comments. This week, has been really amazing for me. I feel like I'm back to my old self and can't wait to offer you more style inspirations w/ ootd posts and info about some of my favorite brands. If you missed any of the looks this week, I'll be rounding up everything tomorrow! 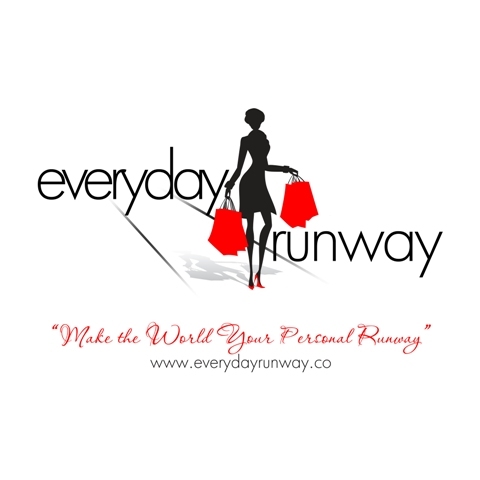 Make the world your personal runway!